Hundreds of migrants drowned when their boat capsized in the Mediterranean, survivors have told the BBC - although there is no official confirmation. The 41 survivors say they were transferred to another vessel when it sank in the middle of the night. They said that up to 500 people died, but coastguards in the region have been unable to confirm their accounts. Numbers of migrants making the dangerous sea route from Libya to Italy have surged this year. The survivors, from Ethiopia, Somalia, Sudan and Egypt, spoke to the BBC from the southern Greek city of Kalamata, where they are being held after their rescue. 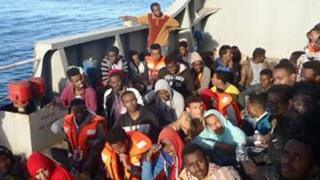 According to the group, about 240 migrants left the Libyan port city of Tobruk heading for Italy. "My wife and my baby drowned in front of me," is the first thing Muaz from Ethiopia tells me, before insisting that at least 500 others died. "Two hundred and forty of us set off from Libya but then the traffickers made us get on to a bigger wooden boat around 30m in length that already had at least 300 people in it," said Abdul Kadir, a Somali. "I was one of the few who managed to swim back to the smaller boat," added Muaz. Once out in the Mediterranean, they said they were transferred to a larger boat already packed with more than 300 people, which then capsized. The survivors were then picked up by a cargo ship, whose crew told the BBC that the migrants initially refused to be handed over to the Greek coastguard as they were determined to get to Italy. A Somali woman living in Egypt told the BBC Somali service that three of her relatives, whom she had not heard from since they set out for Europe on Thursday, had died. The presidents of both Somalia and the self-declared Republic of Somaliland offered their condolences over the incident. The Somali embassy in Cairo put the death toll at almost 400. But the UN refugee agency (UNHCR) has cast doubt, tweeting that the information hundreds had died appeared "inaccurate". The fact that the boat capsized at night in open sea may well have contributed to the lack of clear information available, correspondents say. In a separate incident, six bodies were recovered and 108 migrants rescued when a rubber dinghy sank off the coast of Libya, according to the organisation SOS Mediterranean. The boat was partially deflated, taking on water and its engine was out of use, the rescue group said. The number of migrants arriving in Italy from Libya has surged recently - about 6,000 made the journey alone over a three-day period last week, the International Organisation for Migration said. The deaths come on the eve of the first anniversary of the sinking of a migrant boat in the waters between Libya and Lampedusa in which up to 800 people may have drowned. About 180,000 people have attempted to reach Europe by sea this year, with nearly 800 lives lost, the UN says.